The negative point, however, is the surplus of subplots. 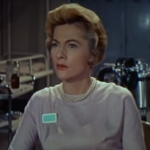 There are enough cases of sabotage on board this ship to get to the point of ridiculous, as well as potential mutinies, constant second-guessing of orders by the second in command, and someone playing the part of Iago by manipulating other people to do the dirty work. 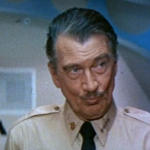 Admiral Harriman Nelson (Walter Pidgeon) is a genius-level scientist, who has developed the most powerful atomic submarine in the history of the world — the Seaview. On its maiden voyage, various politicians (including Howard McNear, The Andy Griffith Show) are on board to see if they’ve gotten their money’s worth. 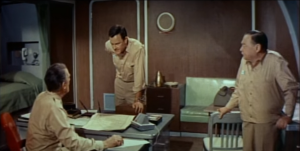 While they are at sea, they discover that the Van Allen radiation belt is on fire, causing havoc across the Earth, and Admiral Nelson is asked to attend an international conference at the United Nations, where he presents his plan — to launch an atomic missile from the Seaview at the correct time and location (the Antarctic) and destroy the space debris that’s caught and burning in the Van Allen belt. 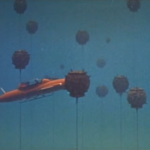 The Seaview is an atomic submarine designed by Admiral Harriman Nelson. On its initial launch some politicians are visiting it to see if all the money they poured into it is worth it. It is while they are at sea that they learn that the belt of radiation covering the Earth is on fire. Nelson is asked to attend some kind of international conference to determine what to do. It is while on route that Nelson comes up with a plan which he presents at the conference. 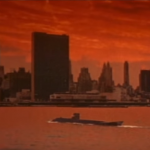 Nelson proposes that if an atomic missile is launched from the Seaview at a precise moment, it will cause it to blow up. Another scientist claims that the belt will burn itself out when it reaches a certain temperature. But Nelson says that if they wait for his proposal, they will miss the window of opportunity that he told them of. Nelson leaves, boards the Seaview, and heads off to make his rendezvous with radiation belt. However, Nelson’s driven manner, causes friction between him and Captain Crane, whose relationship with him is more paternal. 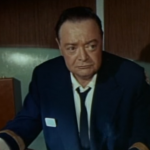 As they push on, some of the crew members don’t want to follow the admiral, and if that wasn’t enough, there appears to be saboteur on board.